Three more months, eh? So the game is basically feature complete and there is only bug-testing left, right? Can you upload a new trailer to showcase the game in its current state, please? 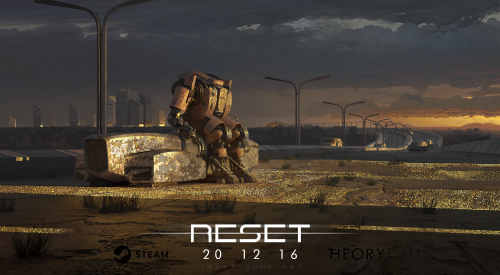 Congratulations team Reset, in theory! I am going to wait for the VR support though before I play, any idea when that will be ready? That is a weird way to write the date but – yeay! No, it’s not. In Europe this is standard. Just over one month to go. Very excited to finally get to play this game. I think I’ll start a Lat’e Play of it on my YouTube channel as soon as it’s released. I’m looking for a few bugs in my post. But I think I should have someone look and point out it. Trueshopee is an Indian e-commerce website used to sell watches, wallets, perfumes,sunglasses, bags and much more. Trueshopee is a well-known company for its quality and genuine products across the country. Trueshopee has brought a paradigm shift in Indian watches market with its affordable and high-quality products. Our key art here is painted with the aid of the crazily talented and expressive Andrey Surnov who became an actual pride and honor to be working with. His unique style in particular in terms of lights and texturing became simply what struck our eye. Strong but specific and expressive. He was capable of capture simply the right moment. Leo Siregar & Associates adalah firm pengacara di Indonesia yang memberikan layanan jasa pengacara, bantuan hukum, konsultasi hukum dan peradilan yang mengedepankan profesionalitas dalam memberikan bantuan hukum di Indonesia. Nice information, thanks for sharing with us this blog this valuable blog. Our key workmanship here is painted by the insanely gifted and expressive Andrey Surnov who was a genuine joy and respect to work with. His one of a kind style, particularly with regards to lighting and finishing was truly what gotten our attention . Solid yet nitty gritty and expressive. He had the capacity to catch only the ideal minute. Thanks for your information! I have read through some similar topics! However, your post has given me a very special impression, unlike other posts. I hope you continue to have valuable articles like this or more to share with everyone!